This Congress we've enacted major legislation like the Tax Cuts and Jobs Act. I'd like to hear how this or other major items before Congress have affected you, your family, or your business. Today Republican Whip Steve Scalise (R-La.) joined Representatives Michael McCaul (R-Tex. ), David Kustoff (R-Tenn.), and Lee Zeldin (R-N.Y.) to announce an effort to discharge H.R. 336, the Strengthening America’s Security in the Middle East Act of 2019. 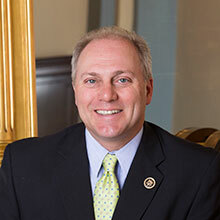 Click "Like" to connect to Rep. Steve Scalise, representing Louisiana's First District in the U.S. House of Representatves.